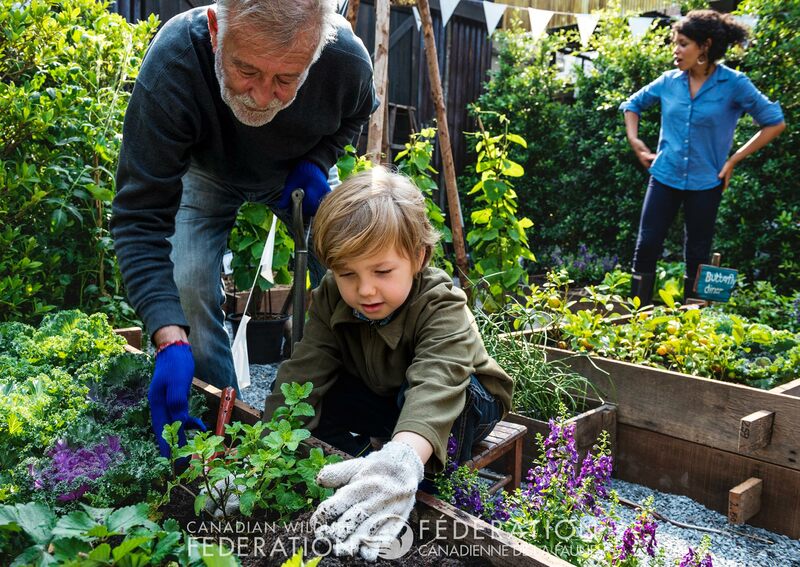 Gardening with Kids Helps Them Grow - And Wildlife, Too! Gardening is one of the easiest and most accessible ways to connect with the natural world. No need for fancy equipment or even funding to travel on a bus. Even the most urban school with little greenery can add some seeds to a re-purposed pallet planter and have access to nature in their very own schoolyard. And with the right conditions, a school garden can help wildlife too. The proven benefits and teachable moments of a learning garden are endless. Gardens create inclusive, group learning environments that can accommodate many different learning styles. Teachers can cover interdisciplinary subject matter and anticipate increased academic performance from their students — particularly in the sciences. Social skills improve as students, teachers, parents and community volunteers work together. A sense of school pride and community contribution results when students share garden lessons, fruit and veggies, or beautify the spaces they work and play in. Spending time in nature helps us to remember that we are a part of and not separate from the natural world. Given our busy, modern, screen-filled lives, it’s easy to forget our affinity for nature. Peer-reviewed studies have emerged to remind us that that being outdoors, or in some cases, even just looking at trees and plants have incredible health benefits. Of special note to educators — some benefits include improved concentration, reduced stress levels and speedier healing times, to name a few. The earlier in life that kids get outside, the better – participating in outdoor nature activities at a young age with a trusted adult, like a teacher or family member, is one of the best predictors of a life-long conservation ethic. This has absolutely been true for me. I grew up in a family that pass down garden plants as heirlooms between generations. I have many memories of my parents, grandparents, aunts and cousins taking turns to help each other in our home gardens. One summer my mother pointed out a bee exoskeleton in the garden and I was hooked. 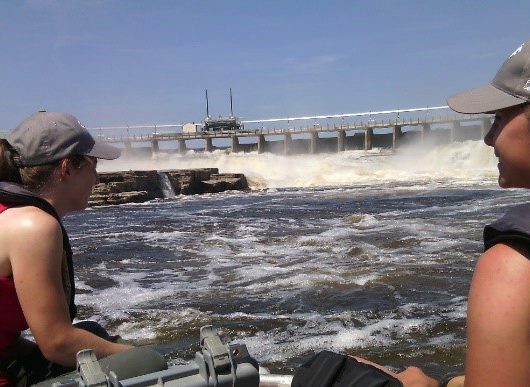 As educators, many of you are facilitating experiences like these for your students. Keep up the good work and please share your garden experiences in the comments below! 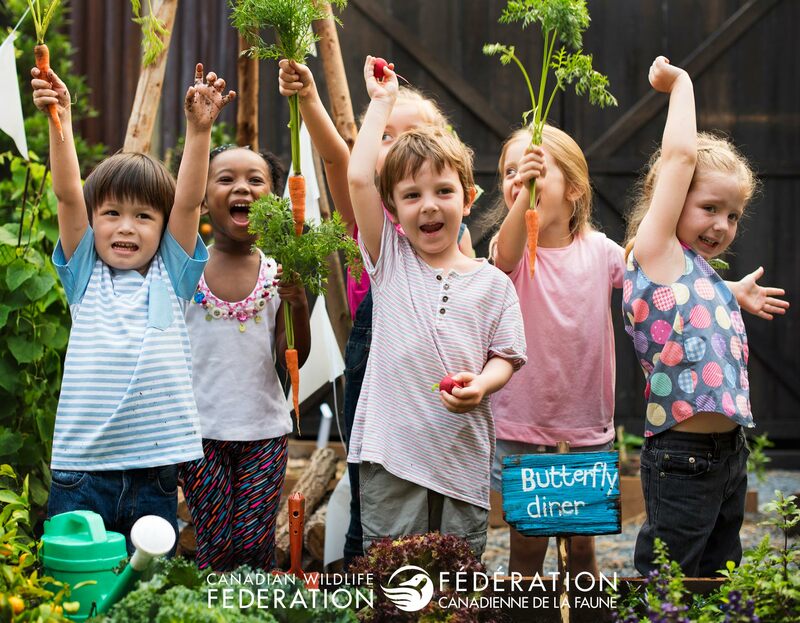 A school garden is great for your students, you and other teachers at your schools, your community – and if the conditions are right, our wild neighbours can benefit too. A garden free of harsh man-made pesticides and fertilizers is essential for pollinators and much healthier for your school community. 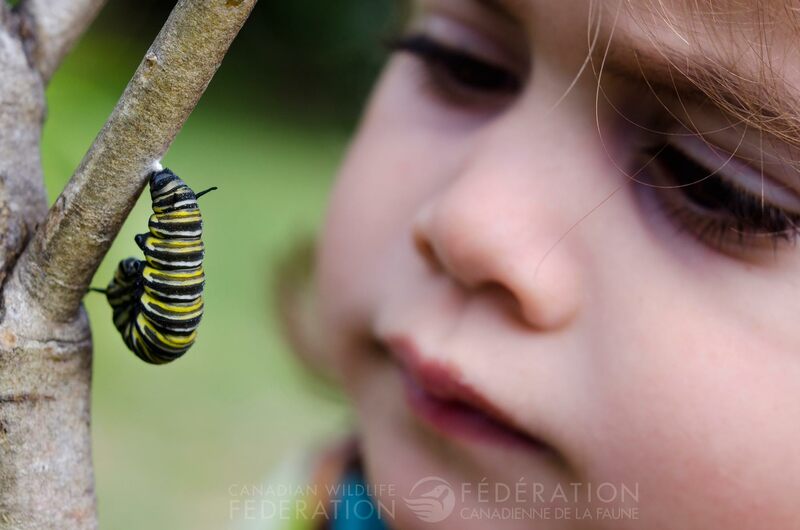 Your school garden can help some of our favourite garden allies – pollinators. 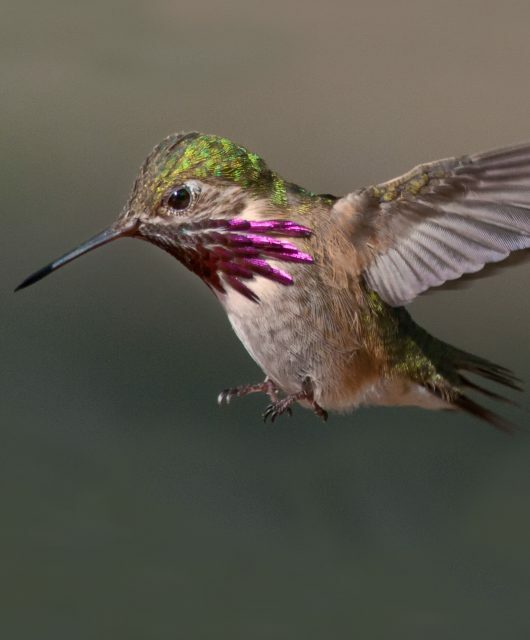 Bees, butterflies, hummingbirds and other pollinators give us delicious foods, healthy ecosystems and help our economy. However, they face many challenges including habitat loss and alterations, pesticide use and climate change. As urban spaces increase to accommodate a growing population and its corresponding infrastructure and food demands, any garden that supports wildlife can make a big difference by creating safe wildlife habitat where there would otherwise be none. All wildlife gardens need food, water and shelter. Pollinators need nectar and pollen rich blooms, preferably in a spot that has six or more hours of sun per day. A garden free of harsh man-made pesticides and fertilizers is essential for pollinators and much healthier for your school community. If your school has concerns about an on-site garden, consider an alternate location, such as a nearby library or community center. Involve your students throughout the entire process – from selecting plants to monitoring wildlife that visits the garden. 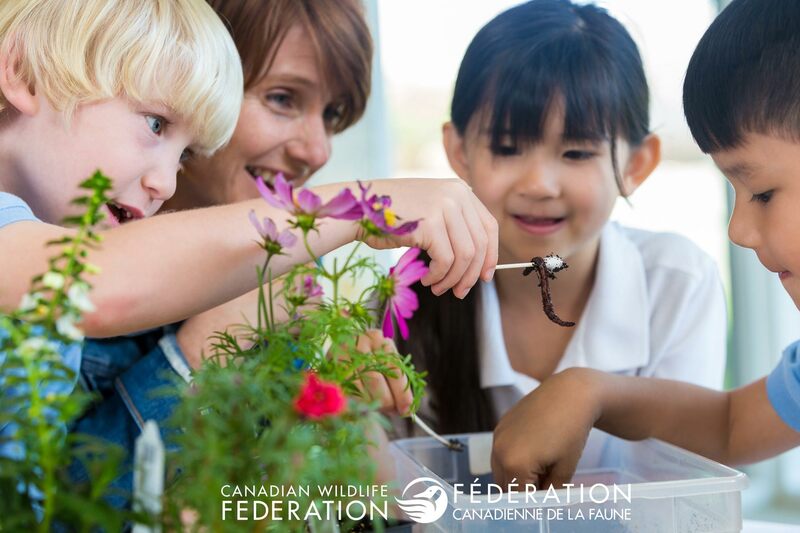 For more information and guidance on school pollinator gardens AND to celebrate your good work by having your school garden officially certified as “Wildlife-friendly Habitat” by the Canadian Wildlife Federation, join our WILD Spaces for Schools program. You and your students can enjoy what might become a lifelong hobby — and help wildlife while you’re at it. 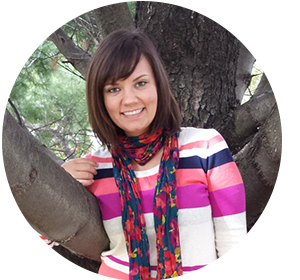 Melissa works with the Canadian Wildlife Federation’s education team in Nova Scotia. 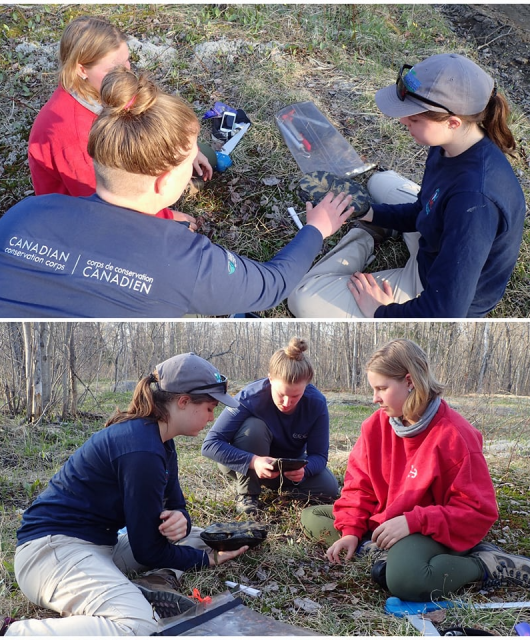 She has a background in wildlife biology and helps manage education programs designed to connect Canadians to nature through experiential and service learning opportunities.